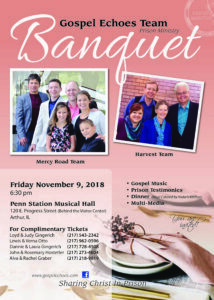 The Gospel Echoes Team Prison Ministry Annual Arthur Banquet will be held at Penn Station, 122 E Progressive St, Arthur, IL Friday, November 9, 2018, 6:30 PM. The evening will include a delicious Home Style Meal, Gospel Echoes Mercy Road and New Life Teams will share Gospel Music, and a Prison Testimony will be presented. A Free Will offering will be received.